"Cool off with this fruity frappe from sunny California." In a blender, combine frozen strawberries, yogurt and orange juice. Blend until smooth. Pour into a tall glass and serve. 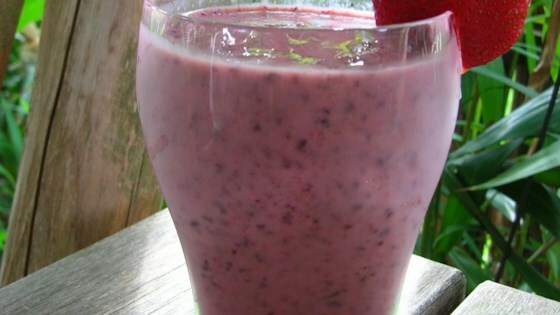 I have tried four different smoothie recipes from this site in the past couple of weeks, and this one is my favorite! It is so tasty and easy to prepare. My children really liked this. My strawberries weren't very sweet, so I added a touch of sugar. Thanks for sharing. Delicious! Really refreshing. I think next time I'll add some vanilla to play with the flavor, but it really doesn't need anything, it's great as is! This was really good and refreshing. I only had vanilla yogurt and DOLE pineapple/orange juice, so I used that. Thanks! This smoothie was really good! I added 2 packets of equal and i had to use peach yogurt instead of lemon because it's all i had. Turned out great!